You want to know how to make all-stars for your baseball league. Maybe you feel like the coaches keep passing you up. 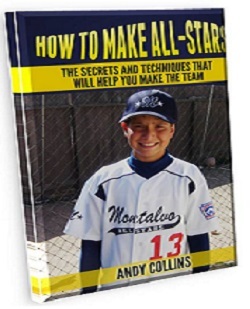 Coach Andy Collins is going to tell you everything he knows from his 35 years of coaching and watching what works and what doesn't work in his new book that is on Amazon.com in paperback or Kindle formats. It's chalked full of ideas in 86 pages. 1) It's right before the all-star team will be chosen and you want to know if you have a chance to make the team or if there's something you can do in the last few games to improve your chances. 2) It's before the season and you really want to make the team again like you did last year or you know you just missed making the all-star team last year and you want to know how to avoid the disappointment you felt at the end of last year. 3) It's the off season and in this book it will tell you what you need to be working on during the off season to prepare you to have the best year ever and even make all-stars even if you've never made the team before. 4) You're a parent or a coach and you either have no idea how kids make all-stars in your area or you wonder if the voters of last year's team even were watching the same kids play as the ones you were watching. You're thinking that maybe, just maybe, it isn't always the best players who make all-stars but some other criteria and you'd like to know what to do about it so your kid(s) won't miss out again. Order Today! and help your player fulfill a dream of theirs. It's only $9.95 and is full of everything you need to know and more. Amazon.com to order your book today! An Added Bonus If you get this book now you can get my video on hitting "Rotational vs. Linear, Which Swing Will Help You Hit Best"! Buy it now, it's the Video and the paperback book for only $39.90, that's less than buying the video by itself.